There are already quite a few services out there offering you free online Bitcoin wallet service, but we’ve decided to try out Xapo as it supposedly offers something more than the other popular alternatives such as Coinbase for example. 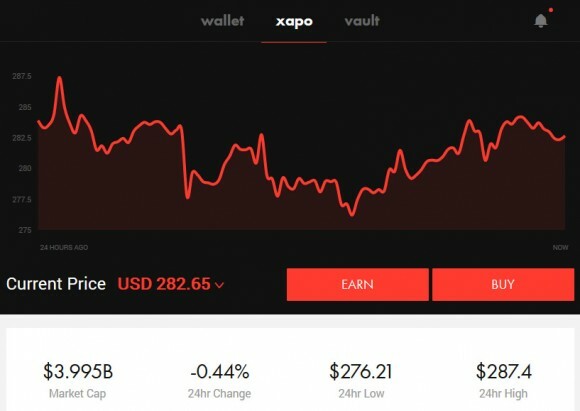 Xapo is an free online Bitcoin wallet and a Vault, meaning that you have access to some coins for daily use in your wallet as well as you can securely store coins “offline” in the Vault. 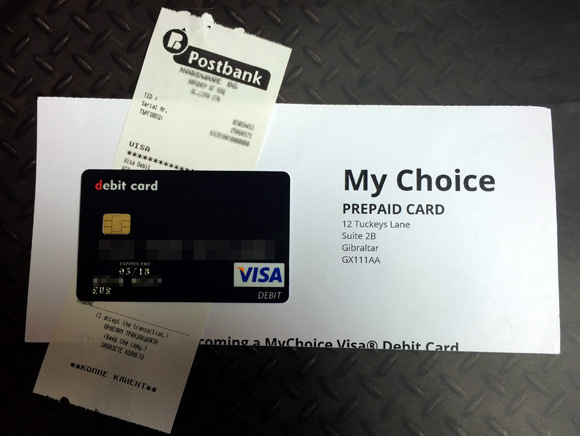 The Vault feature however is not the one that we were most interested in, the thing that we wanted to check out was the fact that the service offers an International Debit Card that is linked to your wallet. This supposedly allows you to spend Bitcoins that you already have in your Xapo wallet through your Debit Card as you would normally use a card with actual money in it for payments – withdraw cash on ATMs or pay in a store via a POS terminal for example. This pretty much saves you the trouble to move Bitcoins from your standard wallet software running on your computer to an exchange, selling them for cash and then withdrawing them to a bank account that also may be linked to a debit card. The Xapo debit card is supposed to greatly simplify and speed up this process, or at least that is expected in theory, but we wanted to try it out ourselves. So we registered our Xapo wallet, a quick and relatively easy process and we’ve got our free online wallet and vault available or almost available. We even got a welcome bonus of 5000 satoshi (50 bits) when we have completed the registration process, not much if you convert it to USD, but then again it is free. However, in order to unlock the full features of the Wallet and Vault we’ve had to confirm our mobile phone number, address and provide an ID number as well to unlock the full wallet functionality. After verifying your identity you will be able to buy Bitcoins, send Bitcoins to other account and transfer your Bitcoins to your vault for secure storage or move them from the Vault to the wallet. The nice thing about the wallet is that besides a standard Bitcoin wallet address that you get you can also use your email address for receiving Bitcoins from services that have been integrated with Xapo with instant transactions and no waiting for confirmations – the ease of use that PayPal provides. This is especially useful when you are using mobile applications where you need to enter your Bitcoin wallet code and cannot just copy and paste the whole hard to remember string of “random” letters and numbers. So now we come to the part with requesting to get an International Xapo Debit Card that is linked to your wallet. It seems that you need to send a request to get in line for the people waiting for such a card and the weird thing is that you need to link your Facebook and Twitter account in order to successfully complete the card request. There is no way to just go for either Twitter or Facebook, you need to have both and link them to your Xapo account and allow Xapo to post something that you are in the waiting list for their debit card. 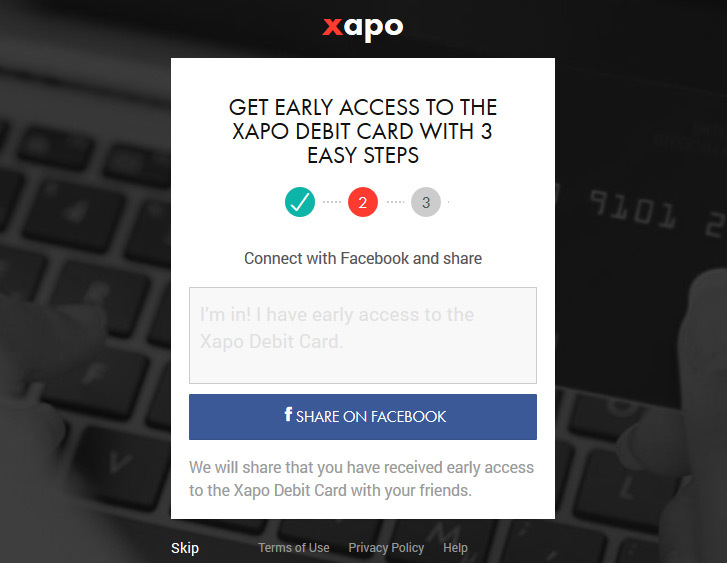 Now, this is not nice, because not everyone has both Facebook and Twitter accounts, meaning that you need to create accounts at these social media sites just to be able to get in the waiting list for a Xapo debit card. So the getting “early access” is a weird process and according to the service “it can take up to several months to receive the card”. 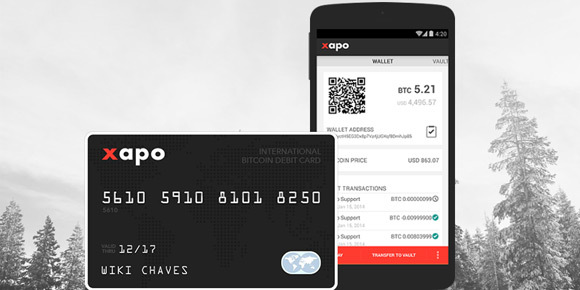 Apparently if you are an European user you have an alternative to get the so desired Xapo Debit Card linked to your online Bitcoin wallet ahead of “the competition”, all you need to do is to purchase some Bitcoins with Xapo. And in order to purchase Bitcoins from Xapo you need to send a SEPA wire transfer directly from your bank account to the bank account provided by the service. There is no information on how much you need to purchase to qualify, only that additional information will be provided once you do a purchase of coins. 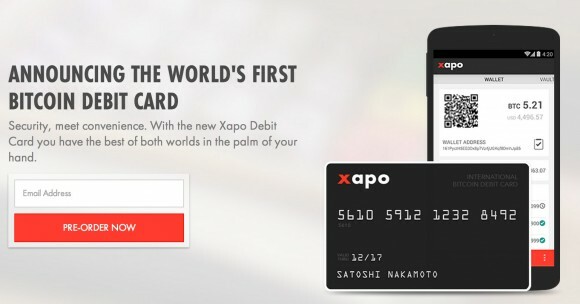 Since the first option for getting a Debit Card will take a while apparently, we are going to try the second option to see if it will get us closer to our goal faster – receiving and actually trying the Xapo card. So stay tuned for more details in the next days when we get things moving, meanwhile you can check Xapo yourself if you are interested.